On my previous post, I talked about Lightning Connect and tried to explain with the Checa Hotel example how it worked. This post is going to explain what you can do with one of the most important elements of Lightning Connect: External Objects. What is an External Object? This is a new type of object that will help us to visualize the information that we have in a external repository after creating a connection between Salesforce and this repo. As a quick reminder from the previous post. We will be able to create an External Data Source linked to the External place and we will be able to create one or many External objects from there. How can we define it? Automatically: via the Validate and Sync button that we can find in the External Data Source. Manually: via its entry on the menu. But in any case my advice is to take advantage of the automatic creation and use the manual one just in case you need to modify something. How does an External Object look like? We are going to continue with the same example as the previous post, the Checa Hotel reservations. And this is the external object. At a first sight it is similar to a custom one. External Data Source: This field is populated with the External Data Source from where we have created the object. This field is required if you create the object manually. Table Name: This name is automatically created when you click on Validate and Sync button and is the name of the table found in the external repository once we have created the connection. This field is required if you create the object manually. Name Field: Here we will specify the field that will help us to open every single record when we create a tab related to this object. At least I couldn’t find a way to modify the value of this field, and the default value is the External ID standard field. However I can also say that if you create the connection via a Custom Connector instead of using Heroku, for instance, this value could be a different one. But this is something we will talk about in a future blog entry. 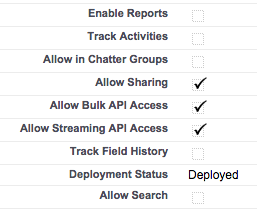 All checkboxes that you can find on below image and belongs to a Custom object, here are missed. So we can now know that Reports are not provided. That could sound disappointing to some of you, but remember that this can change in the future, and also, you can always move this external object data to a custom object and create these reports and dashboards that you need. I know what you are thinking. Where are the other fields like Created By, Last Modify By etc. ? Remember that these records till Summer’15 are not writable, so we don’t really need this information. We are just showing what we have in the external repository. External ID: This field will help us to keep the uniqueness across the whole organization. This does not mean that the ID concept that Custom Object has are not applicable here. These records will also have an ID and we will see it later, but at the same time this External Id is required. Display URL: This is a link and if you click on it, in my case where I have read the information from the Google Spreadsheet, I will have the data in XML format of the record where I clicked this field. This is the section that looks like more similar to a custom object. Here we can find all the fields that the object will have. We will be able to define different types and different features. And if my Heroku application didn’t allow me to specify all that I really needed, I can make any change manually just clicking the Edit link beside the field. We don’t see any relationship on above image, but we can really create Lookups for instance. What we would not allow to do is to create a Master-Detail relationship. But Salesforce give us a couple of workarounds to solve this situation. External Lookup: This field type will help me to link 2 external objects, so if for any reason I have 2 different objects in my google spreadsheet and now I can see both in my Salesforce organization, I can link them via this field type that must be created manually because this is a Salesforce type that Java is not aware of it. Indirect Lookup: This field type will help me to link an external object to a custom or standard one. Let’s talk more about this type with an example. Based on this image, I want to have somehow more information about my guests, in this case, Kim Rosenber. So that, I can save her information in order to send information about the hotel when we have special offers, or give her special discounts based on the number of reservations she has made with us. Because of that, I will create an Account per guest. Now, I would like to be able to click on my Guest Name in the HotelReservation record and go directly to the Account. Also I would like to be able to get all reservations related to each Account, so that, I can decide if this person deserves a special discount. How can I get it? First of all we will need to create a field on Account object. The only requirement is that it should be External Id and it must be unique. Secondly, we need to populate it with the information of my guest. This data should be the same as I have in the external object, so this time would be the name. 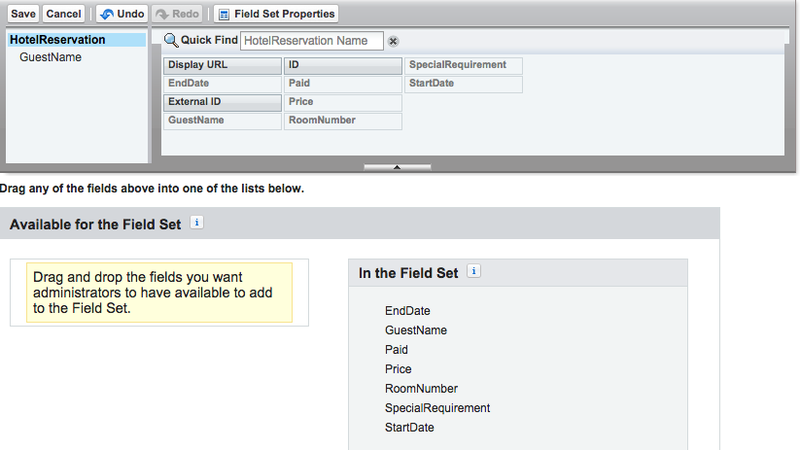 Finally on the External Object we need to modify the Guest Name field type from Text to Indirect Lookup and link it to Account object. As a tip, if for any reason, you don’t create the field on Account properly, it will not appear in the drop down list and you would not have the option to link your Hotel Reservation to Account. We could think that this is similar to usual Lookup fields. The main difference is that in this case I can click on the real Guest Name and navigate to the account. However, with a Lookup, we will need to have an Id value in the External Object in order to make the navigation possible. Like custom objects, this section helps us to modify the look and feel of my record, changing the way that fields are sorted, if I want to add a new section, or blank space. Simple, we have the option to create new Compact Layouts and determine if I require to add any custom button in the List View. We can also perform another actions with these external objects. How? For instance, creating a button with some Apex Code in the background. At the end we could work with them as they were custom or standard objects. Now, the use case is that every time a guest leaves the hotel, we need to print the invoice in pdf format. Let’s think that we are doing this job for a custom object. So what should we do first? As you can see on above code, the controller is really simple. It starts getting the Id of the record so YES!! we can also use getRecord() method with External Object. And continue doing some calculations. The most important thing is the method where we run a SOQL query. HOW?? Yes, even we don’t have any data stored in our organization, Lightning Connect will allow us to perform such actions as well as SOSL. Also I would like to highlight that even we filter by the Id that we retrieved from the Controller, we would be able to use the External ID field as this is also have a unique field value. 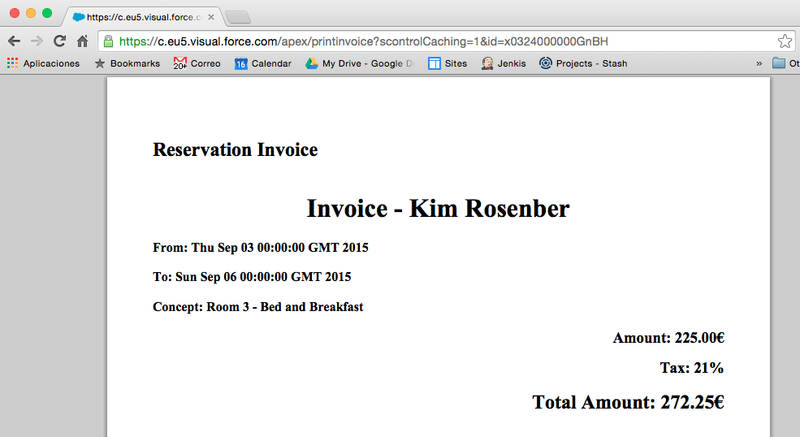 My Visualforce page will be a pdf with the invoice for the guest. First of all the Standard Controller will be the External Object. And secondly we will extend the functionality with the Controller that we created above. 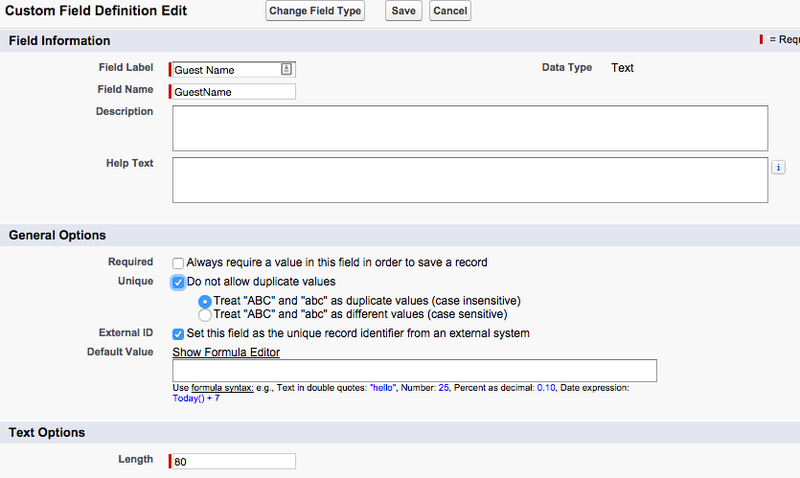 The rest, simple, just call Controller methods and fields in order to show data that we need. 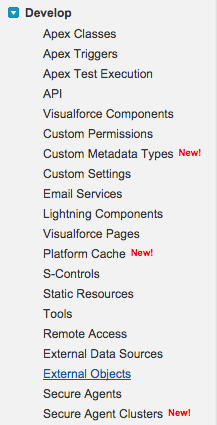 So, is it not allowed to use visualforce tags like <apex:outputField> ? Of course you can use them. Imagine you want to create a Visualforce page with some Reservation data, go for it!! it will show the name of the field as well as the type that belongs to the data. However as this is a pdf, my option was to use directly divs with all data. 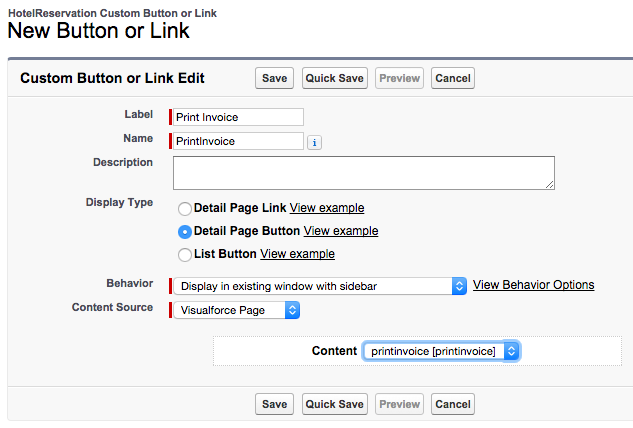 Create a button linked to the Visualforce page that we have just created and add it to the External Object Page Layout. 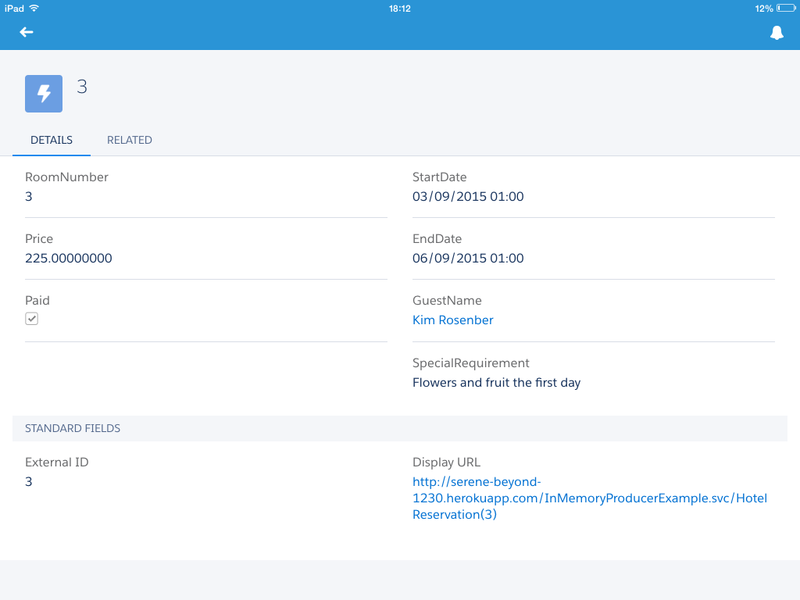 We can also create a field set related to our External Object and show it in a Visualforce page, for instance. My field set will not provide different information from the current page layout, but this is a good example to show how Field Sets also works. Secondly we are going to create a Visualforce page that we will use to override View mode on this External Object. Similar as before we will use the HotelReservation__x as standard controller and the extension will be the same as before. This time we are going to show dynamically all fields that we have included in the FieldSet. 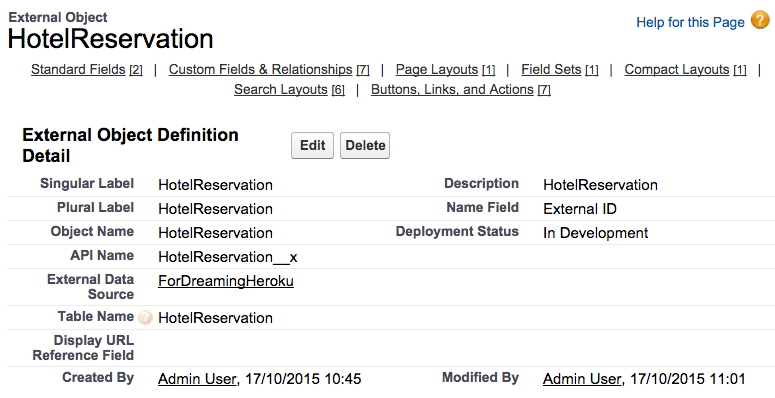 As right now we can find all of them, this is a good page to override the view mode of any Hotel Reservation record. If in the future we need to include more fields or make some modifications, code will be exactly the same, because, as I said before, we get data dynamically. 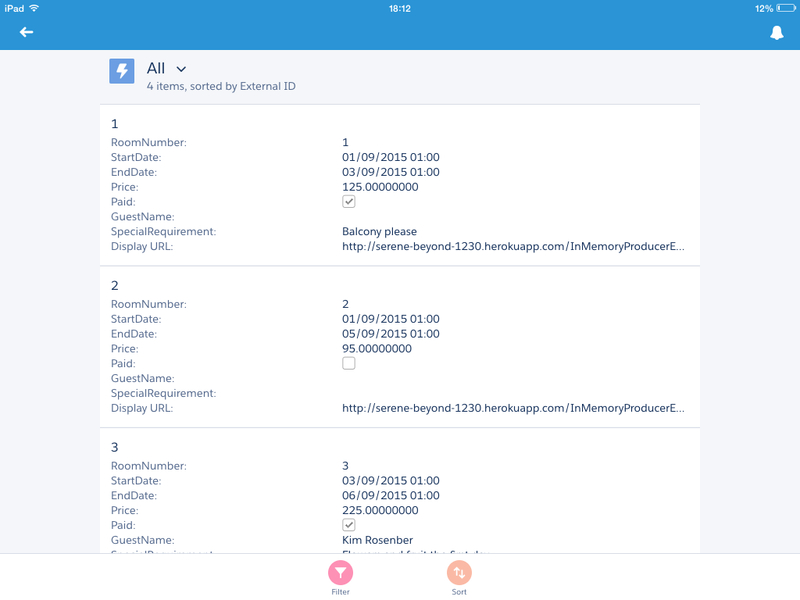 If you are one of these persons that usually works with portable devices like tablets and smartphones, you don’t need to worry about this new type of objects because Salesforce1 app and Lightning Connect also allow you to see this data. We cannot create reports and dashboards with their information. If this is really required for us we can always move the data to a custom object using some apex code, and then create the report from this object. Triggers are not allow. I think that the reason is that actually we are not able to control what can happens outside of Salesforce. Although we can perform SOSL and SOQL, we still have some limitations, like For Update is not allow today. These objects are read only. It means, we cannot edit it and see the change in my google drive, for instance. I have already realized that Winter ’16 give us this functionality, but this is something that I will talk about in a future entry after doing some more researches. I hope this post was useful for you and understand better what you can do with these new object types and how. This entry was posted in Uncategorized and tagged Apex, Lightning. Bookmark the permalink. Actually Master-Detail are not allowed on this type of objects. In addition, if you take a look at the object and try to create manually a new field, M-D is not provided on the types. The document you share above just show you type of relation ships that are provided and with them you can try to make a workaround.